Being the one about cranes and ventilation shafts. 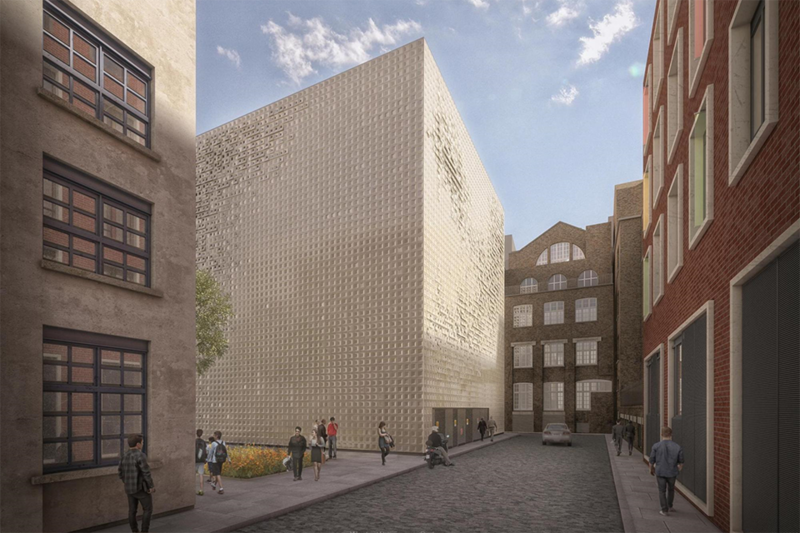 Earlier this week HS2 Limited revealed designs for its new structure that will replace the original Leslie Green building in Melton Street, currently used as a ventilation shaft and emergency access point. This ‘release’ is actually nothing new in any way. The plans and designs were seen earlier last year and its just that HS2 have confirmed the designs and are now putting these to Camden Council. HS2 had a community consultation with locals in May 2018 and this is when they released the design in question for the first time. It seems locals were none too pleased with the design. Nevertheless HS2 has without a doubt gone ahead with the hated style for the replacement ventilation shaft. The new ventilation shaft building design for Stephenson Way was first seen in May 2018. 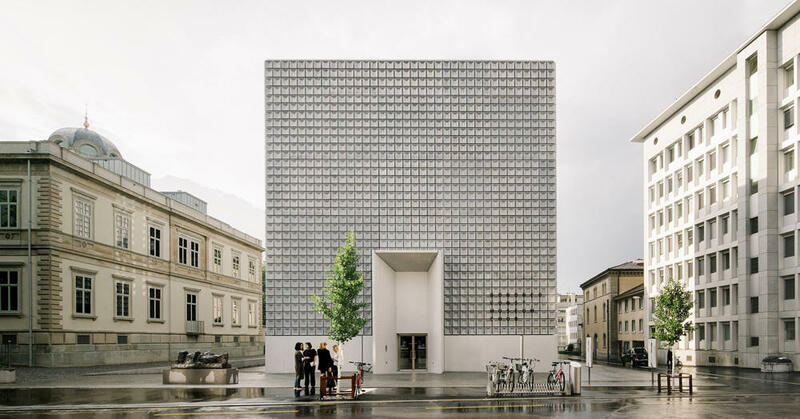 It is absolutely clear from the HS2 document realesed in May 2018 the new ventilation shaft in Stephenson Way is based on the Bündner Kunstmuseum in Chur, Switzerland. I would say the Chur example has its merits, like the Louvre, Lloyds Building, Guggenheim and others. The example touted for Stephenson Way is just bland. Its totally out of scale with the area and a blight on the locality’s character. 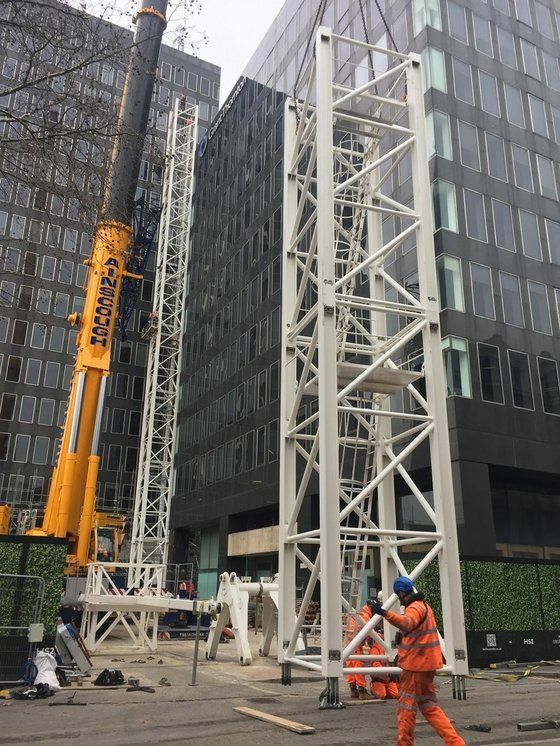 HS2’s London Programme Director, Rob Carr said: “The new vent shaft will be one of the first things we build and it’s important we get it right. I hope this intriguing, functional and contemporary design will be welcomed by all those who live, work and travel through Euston.”They also claim the design will be a “local landmark of distinct architectural quality”. Source: World Construction. A couple of comments on the HS2 consultation page regarding the new tube ventilation shaft. Here’s a link to HS2 designs which were first released in early May 2018. This shows the same images just ‘released’ this week (16th January 2019.) In the document you can see HS2 are asking for community feedback on the new designs…..
As you can guess StopHS2 have totally slated the plans and they have every right to be concerned that this apparent monstrosity which locals do not want is being imposed without a second thought by HS2. This seems to be another example of where something of huge impact related to HS2 is imposed upon others. Despite consultation with the people of Euston, the minds at HS2 already seem to have been made up. Waiting for the demolition cranes…. Leslie Green’s station building with Grant Thornton House behind. Okay. 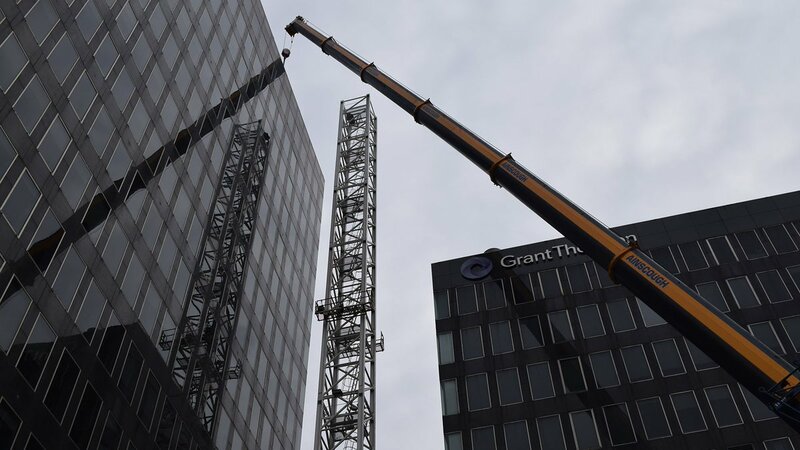 The other news this week is the cranes that have gone up around Euston in readiness for the demolition of several of the buildings. Although most note the presence of the tall crane in between the two Euston towers, another went up behind the Wolfson building clearly for the purpose of demolishing that structure. I’ll just let the story flow with images from Twitter (as well as some of my own pics) …. I took pictures of the jib belonging to the Grant Thornton crane as it stood on Melton Street waiting to be erected. This was about 11am on Sunday 13th January 2019. 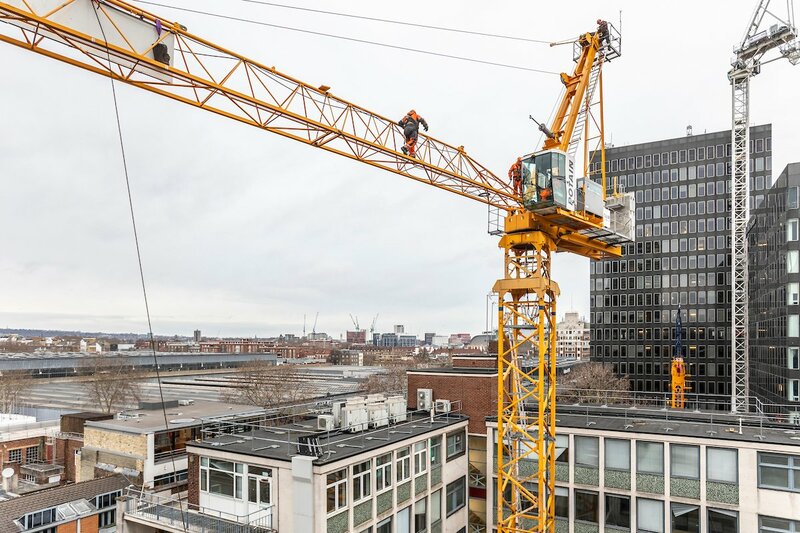 The main picture at the top of the page shows the largely completed crane towering above the Euston Road. Previous Post: Don’t you wish this was true? Next Post: 345 driver confused at Stratford? What a horrific ice block. No redeeming features whatsoever. A vile thing – what are they thinking of?? Much as I have no love for this design, many objectors seem to believe that it will take the place of the historic Leslie Green building at the same location. This isn’t true. The Leslie Green building is in the way of the new station itself, and this edifice is being built in a new location to replace the functions it currently houses. The new location is currently the site of a 6 storey 20th century office block, whose architecture can best be described as unremarkable. So there is no weight to the claim that this is “out of proportion” as it’s less so than the current building on the site. 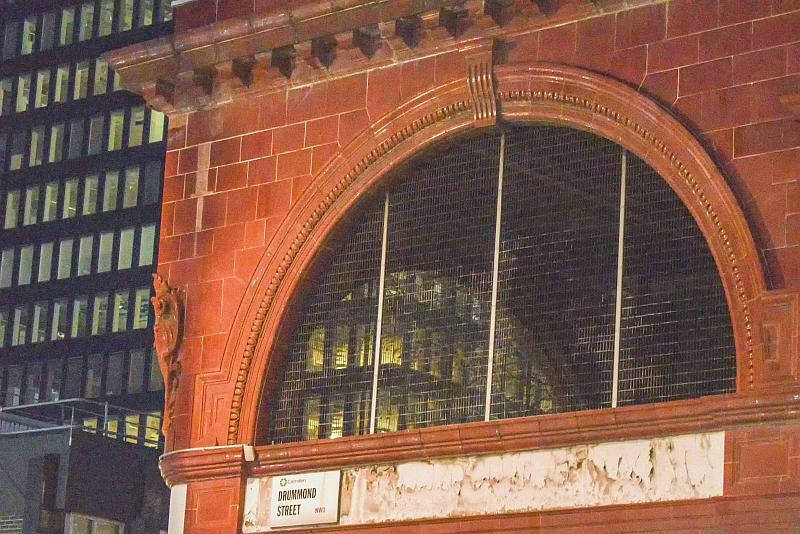 Also it’s not strictly true to say that heritage is being destroyed just to build this – the historic tube station is being demolished to build the new Euston platforms, not this structure. All that said, I agree the design is far from elegant and personally I’d advocate something that’s less of a statement and more of an unassuming modern building, reflecting the back street location.